The Weslo Cadence R 5.2 Treadmill is basically a walking treadmill with 2.5 CHP motor with 16’’x 50’’ tread belt size. It also presents a quality design that is yet affordable for those that wish to acquire a walking treadmill for home use. It is also a compact machine that saves space thus ideal for those with a space problem in their condo. The unit is widely accepted and has a popularity that shows that it worth having in the home gym. The Amazon customer reviews are currently at 636 with an approval rating of 4.0 out of 5. If you really wish to solve half of the problem of your buying decision simply look at the approval rating of the product you are interested in and see what other real users are saying about it. That way, you will be able to decide if you should go further to look up the features of the product or not. There are retailer reviews out there that are credible and one of such retailers is the Amazon. 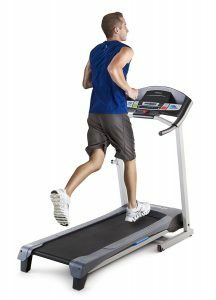 That being said, you can still jog and run on this treadmill but that still depends on your height because taller individuals will rather find it not convenient to run on. And also, it is not meant for serious or running enthusiasts, after all, it is not its primary purpose. If your primary need is to get into shape and lose some weight then the Weslo Cadence R 5.2 Treadmill might just be a perfect choice. Its built-in 6 workout apps are specifically designed to do just that and help you improve your overall physical fitness. It is also good for light and intense workouts because of its 2.5 CHP motor with a maximum speed of 10 mph. The motor is unique in the sense that it has the capability to cool off the internal components even as it delivers speed, interval, and endurance training. The 16’’ by 50’’’ tread belt is great for walking exercises and for all different users of all heights, however, where there might be some restrictions is when certain users of certain height size try to perform running exercise. The running surface is well cushioned to prevent any joint stress that is usually associated with running. The Weslo Cadence R 5.2 Treadmill is a strong and durable treadmill, especially for a low-budget range treadmill. It is well built with comfort to deliver an outstanding workout experience and supports up to 250 pounds maximum user weight. 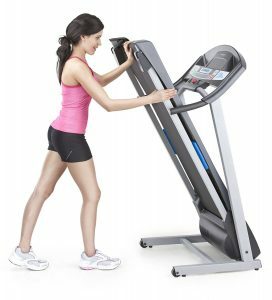 Users have attested to this and have confessed that a treadmill of this price range exceeded their expectations. This machine is simply sturdy! It does have 2-position adjustable incline that could positively affect your workouts in order to achieve your fitness goals and it does decrease the impact on your joints as well. So, it increases positive workout results and decreases stress on the joints. It can easily be adjusted to burn more calories, tone more muscle and of course build greater endurance. The read belt size is 16’’ by 50’’ and is perfect for walking and jogging users. Some users can as well perform running exercises but it is not guaranteed that they may achieve their full stride and comfort. It has been stated that it is great for all users of all heights but that will be true if they are using it for walking or jogging exercises. Most often the concerns of working out on the treadmill or outdoors have always been joint pains but most modern treadmills have designed the running surface in a way to reduce or even effectively prevent stress to the joints. The running surface of the Weslo Cadence R 5.2 Treadmill is designed to reduce the impact on the joints so that users can experience comfortable workouts and faster recovery time between workouts. The Weslo Cadence R 5.2 Treadmill has 2.5 CHP that is quiet in operation while it provides power for endurance training, interval and speed. It cools the internal components as it provides the drive for light or intense workouts. It has 0 to 10 mph speed. On the console, it has a large LCD monitor that will help you track your workout progress by displaying data such as the speed, time, distance, and calories burned. This makes your workouts trackable and helps to realize your fitness goals. This unit has a space saving design that makes it fits even in rooms or apartments with a space problem. You can easily fold it up as well for storage in order to free up space any time you are done working out. To assemble this unit is pretty easy as it is shipped and delivered with most of its major components preassembled. Therefore, assembling it is never a problem and can be done in less than an hour for an averagely skilled person. Their customer service has been applauded by users and how they respond to issues proactively. They also replace any defective parts and even replace the entire machine if they have to. This is important because you will be covered in terms of getting what you paid for in good condition. Do buy from Amazon for better customer service experience. 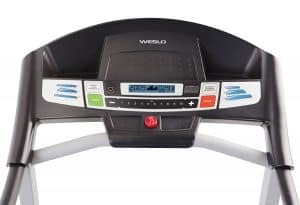 The Weslo products generally require little maintenance and so does the Weslo Cadence R 5.2 Treadmill. This means, it does not need any kind of lubrication but simply wipes off dirt, dust, and sweat after use and before use. The shipping cost of this unit varies depending on the retailer you are purchasing the unit from. However, it is shipping cost free if you are purchasing from Amazon. It has a 1-year warranty for the motor and 90 days for parts and labor. Although, you have an option to buy up to 3 years warranty. There are few things we considered to be a drawback which may not be all that important to every individual but it is our obligation to mention them. The monitor is non-backlit which means you can you cannot view the data with the light turned on in the room you are using it. This could be kind of a problem if you intend to watch the TV while the light is turned off. It does not have heart rate sensors on the handlebars consequently you cannot view and track your heart rate data during a workout neither can you be able to maintain your target heart rate zone. LCD monitor displays workout data such as speed, distance, time, and calories burned. You can also read the review of the Weslo Cadence G 5.9 Treadmill right here. The Weslo Cadence R 5.2 Treadmill is a recommendable treadmill given the fact that it is very sturdy and affordable. This is a perfect machine for those that simply want to get something simple yet effective to add to the home gym. Specifically for individuals that wish to walk and jog often than to run. Therefore, if you fall into this category and do not have issues with the aforementioned drawbacks then this unit is tailored for you. Do not hesitate to ask any questions you may have because we will be glad to respond accordingly.